Republicans won the Senate for the first time in almost a decade Tuesday night, giving the party control over both chambers of Congress, and setting the stage for even more political confrontation with President Barack Obama during his final two years in office. The GOP needed to pick up at least six seats to recapture the majority and as of late Tuesday night it had netted seven, with the possibility of winning one more when the Louisiana Senate race goes to a runoff next month. Senate Minority Leader Mitch McConnell prevailed in one of the hardest-fought reelection fights of his career, and will almost certainly be selected by his colleagues as Majority Leader. “The truth is tonight we begin another [fight], one that is far more important than mine, and that is to turn this country around,” McConnell told cheering supporters in Louisville after dispatching Alison Lundergam Grimes, Kentucky’s Secretary of State. Looking ahead to dealing with Obama as a lame duck, McConnell, who famously described the GOP’s top political priority as making him a one-term president, opened the door just a crack to compromise. Current Senate Majority Leader Harry Reid, the Nevada Democrat who will now have to yield the top spot to McConnell in December, congratulated his colleague—and often nemesis. Republicans won competitive Senate races in Iowa, North Carolina, Georgia, Arkansas and Colorado, and held off a wealthy independent candidate who almost brought down longtime Republican Sen. Pat Roberts in Kansas. The GOP prevailed in a multi-candidate Senate race in South Dakota where Democrats had hoped an independent candidate would split the vote, and picked up a Montana Senate seat vacated by a retiring Democrat as expected. In New Hampshire, Democratic Sen. Jeanne Shaheen held off Republican Scott Brown, a former Massachusetts senator who moved to the Granite State to challenge Shaheen. The Senate race in Louisiana headed to a Dec. 6 run-off after neither Democratic Sen. Mary Landrieu nor Republican challenger Bill Cassidy mustered the majority support needed to win outright. But when Republicans knocked off the Democratic incumbent in North Carolina, the GOP had the seats it needed for the majority. 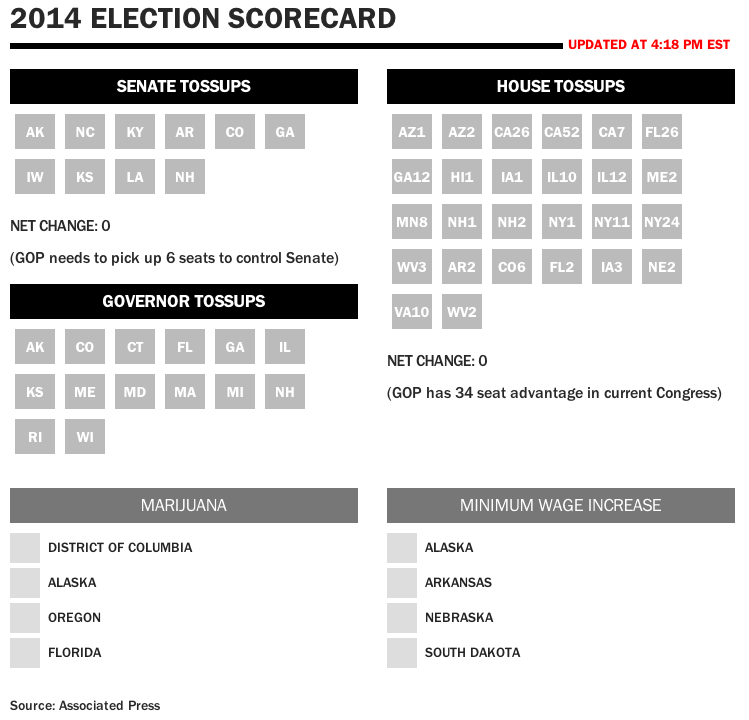 Republicans expanded on their majority in the House as expected. Obama, whose middling approval ratings are dragging down Democratic candidates across the country and who has exclusively campaigned for candidates in safe Democratic territory, mostly stayed out of sight Tuesday. He held meetings with Vice President Joe Biden, Defense Secretary Chuck Hagel and officials handling his Administration’s Ebola response, but he didn’t campaign. Exit polls indicated voters felt deep dissatisfaction with Obama and both parties in Congress, with two-thirds saying the country was headed on the wrong track. The President famously declared the 2010 election a “shellacking” the day after Democrats lost the House to Republicans, and a White House official said late Tuesday that he had “invited bipartisan, bicameral congressional leaders to a meeting” for Friday. The Administration sought to downplay the idea that the race was about Obama. “Ultimately it’s the quality of these candidates that are going to be the driver in this election,” White House Press Secretary Josh Earnest said. Early Wednesday, Earnest said Obama would hold a news conference in the afternoon. The Republican Party now faces the challenge of governing with full control of Congress, and will surely continue to face competing pressures from conservatives who want to challenge Obama by passing ideologically “pure” legislation and forcing him to veto it, and from moderates who see cutting big deals on immigration and other issues as the better path toward winning back the White House in 2016. The obstacles facing McConnell were again on display just moments after Republicans emerged victorious when Texas Republican Sen. Ted Cruz, a staunch Tea Party conservative and possible 2016 candidate, again won’t commit to backing McConnell for Majority Leader. “That’ll be a decision for a conference to make,” Cruz said on CNN. Tonight “was a powerful repudiation of the Obama Administration,” Cruz said. The only potential bright spot for Democrats was supposed to be gubernatorial races, where some Republicans elected during the GOP wave of 2010 looked poised to go down in defeat. But in Florida, Republican Gov. Rick Scott held off Democrat Charlie Crist, a party-switching former Republican governor of the state himself. And Wisconsin Republican Gov. Scott Walker, who has been a top target for Democrats ever since he pushed through legislation that stripped public employees of collective bargaining rights, beat his Democratic challenger.